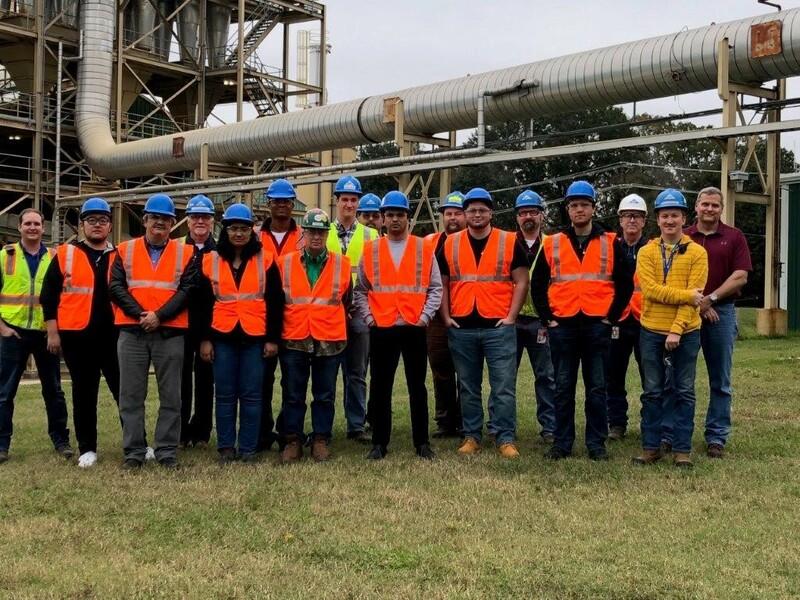 November 8th, 2018, UNT students taking Dr. Shi’s Bioproduct class were so excited because they were going to visit Georgia-Pacific particleboard operations and see the knowledge they have learned from the class in real manufacturing. Georgia-Pacific particleboard operations facility is located in Diboll, TX, where is about 4 hours driving from Denton. Students grouped up at 7:30am near the ZOE lab, and Robbin Shull, the MEE lab manager, drove everybody to Diboll. At Georgia Pacific, with introducing and explaining from plant manager, technical director, safety technicians, and professional tour guide, students visited material storage, vibrating screen machine, drying system, blending system, hot press machine, quality control department, and packing & shipping area. Georgia-Pacific LLC is one of the largest paper, pulp, building products, and related chemicals manufacturers and distributors in the world, its HQ is located in Atlanta, Georgia.